' Thus saith 'NOT' the LORD !!! 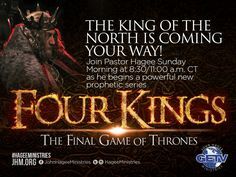 Another False Prophecy Proclaimed That Obviously Did "NOT" Come To Pass !!! Someone prophesied that something was going to happen on September 23 of 2017 and one brother's website garnered over 9+ million visits !!! September 23 of 2017, came and went and obviously nothing 'Biblically Prophetic' happened. Then came the craze also about the 'Blood Moons' and EUinProphecy.com also did 'NOT' accept such a 'Prophecy' ( Interpretation ) as a major Biblical ocurrance nor did we promote it. More recently several self proclaimed 'Prophets' that do allow themselves to be called 'Prophets' and mention such a title in their websites 'Prophesied' that Trump and the Republican Party were going to enjoy a epic Republican sweep in these midterm elections and very obviously that NEVER happened in fact here in California and especially in Orange County which in the past voted Republican; this time around the Republican Party suffered major defeats there !!! This servant of GOD is "NOT" going to mention any names but the two main 'Brothers' who were promoting a 'Republican Red Tsunami' almost never quote the Prophecies of Daniel, in fact one of the 'brother' already has had about 5+ major 'Prophecies' that never came to pass last year and 'YET' major Christian news sources ( such as CBN*) were 'promoting his Lies and his 'False Prophecies !!!' This servant of GOD finds it disturbing that even though those 'Brothers' "Red Tsunami Prophecy" very obviously did 'NOT' come to pass, such 'brothers' seem to have 'NO' shame to admit that indeed 'GOD MOST CERTAINLY' is "NOT" to blame for their FALSE PROPHECIES !!! 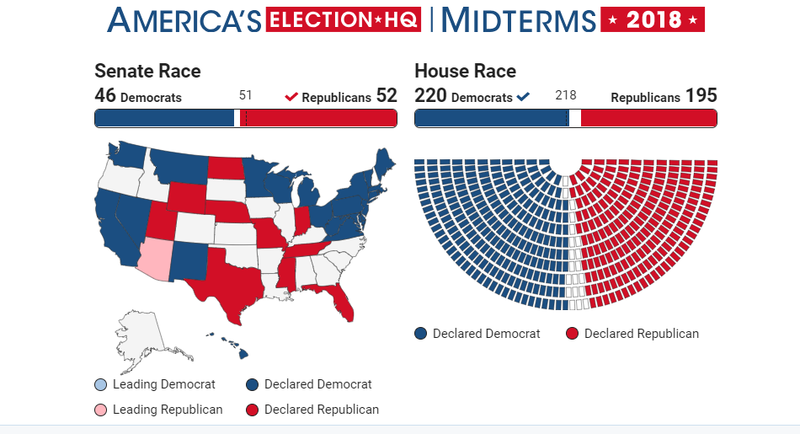 This Graph / Map shows that there was obviously 'NO' major 'Red Tsunami' ( Republican Sweep ) all over America in these 2018 Mid-Term Elections !!! Because Mario Romano is still on a 'Prolonged Break' I'm going to keep it short. The truth is that 'MOST' of those who call themselves 'Prophets' in my opinion seem to have absolutely 'NO' knowledge of the Biblical Prophecies especially those of : Daniel, Ezekiel and Revelation and the Bible itself confirms to us that 'ANY' man or woman that Prophesies in the name of GOD and whose Prophecy does 'NOT' come to pass is a 'False Prophet' period !!! ( Deuteronomy 18 : 22 ) Such believers should only state that it is their 'Opinion' but they have 'NO' right nor business in stating that 'GOD TOLD THEM' when very obviously GOD did 'NOT' !!! The truth is that most of GOD's true Prophets suffered great persecution and a terrible death, today almost everywhere i go i find 'Self Proclaimed Prophets' ( especially on YouTube*) prophesying 'Prosperity and Good Times' when the Book of Daniel and Revelation reveal to us the contrary; that the world economy is going to suffer major setbacks !!! If you really want to hear directly from GOD Himself this insignificant servant of GOD recommends that you open your Bible and READ IT ALOUD to yourself, too many believers have stopped reading the Holy Bible and are taking the word of 'Self Proclaimed Prophets' that almost never quote Daniel nor Revelation and that reveals to me that they almost have 'NO' true eschatological understanding of the times in which we are living. This insignificant servant of Jesus Christ even heard and saw on Youtube those so called 'NAR Prophets' 'Prophesy' good things about Macron and I said to myself if they have ever read the Book of Daniel to begin with; because very obviously they seem clueless about 'The Signs of The Times' !!! In conclusion, anyone who claims to have been told directly by GOD something that does 'NOT' comes to pass is 'You Know What.' GOD our Father and Creator can 'NOT' lie and very obviously Mario Romano does absolutely 'NOT ' believe in the so called 'Trump Prophecies.' Yes, it is GOD who raises King's and removes King's 'BUT' it doesn't mean that Donald Trump is going to 'Financially, Politically and Spiritually' save America from half a century of financial mismanagement and not just by our Federal Government but by even our local politicians who in our name have been indebting this nation with hundreds of $$$ billions of dollars in : Bonds, Pensions and so many other financial obligations that are 'NOT' sustainable !!! The last time I studied what the average American Citizen/ Taxpayer owes because of local, state and federal debt obligations done in his/her name the average American is on the hook for some $ 38,000+ each, it should be very obvious that our National Debt will never be payed off; and I'm 'NOT' a Prophet but you don't need to be one to acknowledge what awaits the American Economy and the U.S. Dollar in the not too distant future !!! This insignificant servant of Jesus Christ reminds everyone that the WRITTEN Prophecies found in the Holy Bible 'ALWAYS' take precedent over any and all personal : Dreams, Visions and 'Revelations' that any human mortal may claim to have experienced !!! 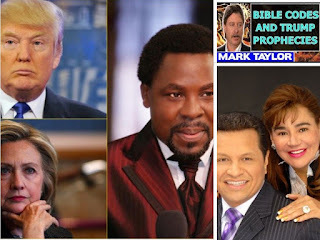 When someone like the 'Brother' who claims to have received the 'Trump Prophecies' ( Other Brothers/Ministries have found several Theological /Eschatological flaws in the 'Trump Prophecies'* ) from GOD come forward with 'Prophecies' given directly from GOD and yet such 'CONTRADICT' those of Daniel or any other Prophet in the Bible then they obviously should 'NOT' be believed for our GOD is 'NOT' a GOD of confusion. 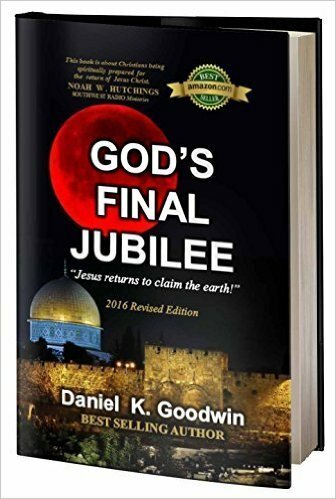 If you really want to know what the future holds for : Planet Earth, Israel and all the nations ; then you need only study the Book of Daniel and Revelation and you will find out that President Donald Trump may very well be one of the last American Presidents very simply because the 'Times of the Gentiles' is rapidly coming to a close !!! By : A GOD fearing Watchman who is 'NO' Prophet nor the son of one and who seeks neither : fame, notoriety, $$$, invitations nor attention from anyone. 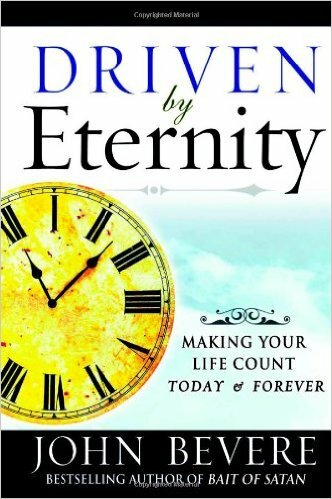 Mario Romano is sticking to the only true and proven Prophets of GOD found in the Holy BIble and he recommends that you do too !!! The truth is that although President Trump is 'NO' King David nor King Solomon his sins will eventually expose him for what he truly is; just like it happened to King David and King Solomon. This insignificant servant of GOD laughs at 'NO' one's sins !!! As an American citizen I pray that President Trump will one day genuinely REPENT of all his sins and his lies, in the mean time based upon the Prophecies of the Book of Daniel this servant of GOD acknowledges that the future does 'NOT' look good neither for America nor for President Trump let us not kid ourselves; history has shown us that 'NO' human empire on this planet has lasted forever and America will unfortunately 'NOT' be the exception !!! The First Annual 'Paris Peace Forum' and Bible Prophecy. 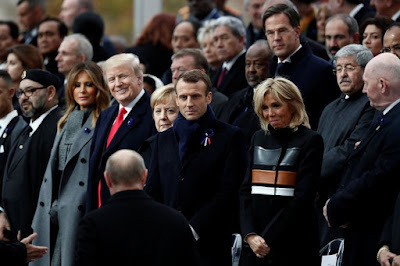 On this Sunday, November 11, 2018 about 60 of the most relevant world leaders attended the beginning of what is planned to be an annual 'Paris Peace Forum' in the 'City of Lights.' The leaders of some 60 nations attended Paris at the invitation of the President of France. American President : Donald Trump and Russian President : Vladimir Putin tried to avoid the 'Paris Peace Forum' which was scheduled to follow the 100th Anniversary of the end of World War I ceremonies held in Paris also. Trump did not attend it but Putin finally did. 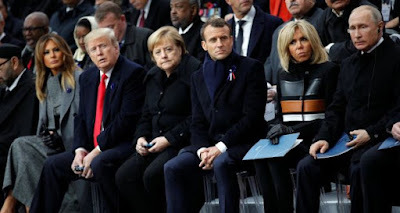 This student of Bible Prophecy writes this with a very 'heavy heart' because some of the very world leaders who were in Paris, France attending the 100th Anniversary of Armistice Day that officially ended World War I will be some of the very one's who are going to be involved in the upcoming : Wars of Ezekiel as well as World War III and very unfortunately the symbolism of Revelation indicates to this student of Bible Prophecy that such wars will go nuclear during the Tribulation period as the 1st Horseman of the Apocalypse goes on his quest of 'global conquest' ( Revelation 6:2 ) as he tries very ambitiously to outdo the conquests of Alexander the Great and even of those of the ancient Roman Generals and especially the actions of Roman General Titus who destroyed the Temple in Jerusalem in 70. A.D. !!! This student of Bible Prophecy is going to be very brief in this article because he's still on a 'prolonged break' from the internet 'BUT' because events such as this one do 'NOT' happen everyday 'NO' Prophecy student / teacher can nor should ignore an event like the one that just took place in Paris, France this : 11-11-2018. You don't see the United Nations, the EU as a whole nor Berlin and much less Russia going out of their way to sponsor a 'Global Peace Event' like the one we just witnessed in Paris. 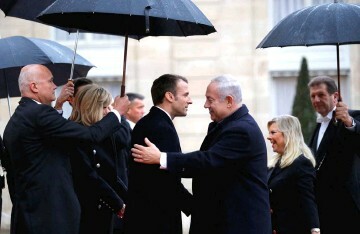 Even Israel's Prime Minister : Benjamin Netanyahu was in attendance too !!! What we are witnessing is a clear pattern of the future of the Middle East Peace Process, we are witnessing how German Foreign Policy tries to ignore and avoid the entire Middle East Peace Process ( and most other regional conflicts*) as much as possible and we are also witnessing how uninterested London is about it too !!! 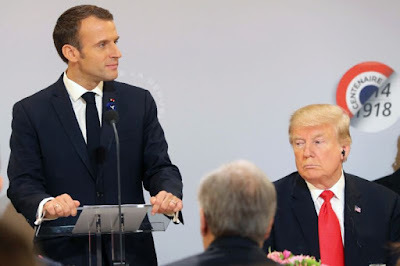 Paris, France is emerging to a role that presently 'Brussels' should be fulfilling ( Brussels is considered as the official/unofficial Capital of the EU*) enter Emmanuel Macron who single-handedly seems to eclipse and overshadow the : Secretary General of NATO as well as the top EU Foreign Diplomat : Federica Mogherini and even the United Nations Secretary General who was in attendance too and Macron almost accomplished it without breaking a sweat !!! Presently, Rome is out of the picture very simply because Italy is almost in the same $$$ economic mess as Greece. Salvini has a 'Big Mouth' but Italy is 'NO' nuclear power so this student of Bible Prophecy is not so much worried by Italy's Salvini !!! 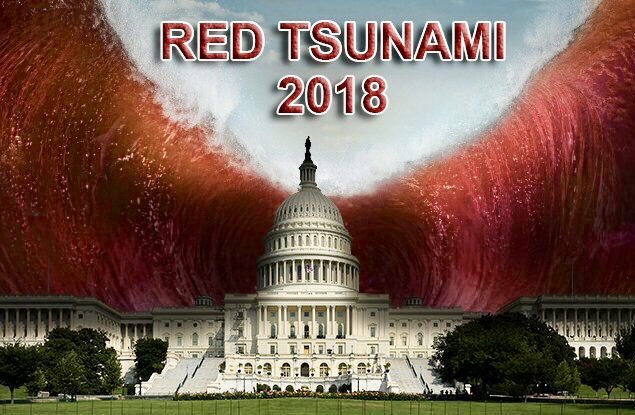 Additionally, Italy doesn't have the 'Military Might' and much less the $$$ economic means to put on a show like : Paris, France just did on this November 11, 2018 !!! Yes, even with all of its internal problems and challenges; France is still one of the top 8 economies in the world and what concerns me more is that it is only one of two nuclear powers headquartered geographically in the Mediterranean Sea, the other being Israel. Yes, Russia has a 'Nuclear Sub' and a Naval Fleet presently stationed in the Mediterranean Sea via the Tartus Naval Base in Syria 'BUT' its only temporary according to Bible Prophecy !!! Mario Romano is 'NOT' a Prophet of GOD nor the son of any Prophet 'BUT' having read and studied the Prophecies of the Book of Daniel for almost half of my life 20+ years; this student of Bible Prophecy and WATCHMAN must warn all our visitors that it is very 'highly likely' that we have/ are witnessing the early steps/stages/foundation of the prophesied endtimes 'Covenant With the Many' like 'dress-rehearsal' take place before our very eyes in Paris, France on this 11 day of November 2018 !!! 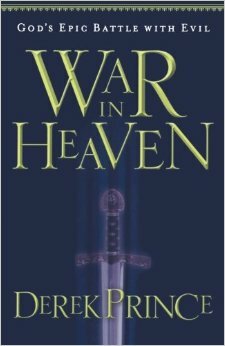 The first thing that came to my mind when I heard/read about the first annual 'Paris Peace Conference' was the Prophecy of Daniel 8 : 25 and what 'You Know Who' declared to the global media and that made President Trump 'furious' sure did remind me of Daniel 11 : 38; it could be that this student of Bible Prophecy has read the Prophecies of Daniel 'one too many times' or it is very likely that we are witnessing the early days of Daniel's 'Little Horn' begin to take shape and slowly but surely increase in : power and global influence !!! He could be the perfect DECOY or the 'real thing' and EUinProphecy.com wants to make it perfectly clear that we have 'NOT' finalized studying Daniel's 'Little Horn' and his true and final human identity. This student of Bible Prophecy is very well aware that 'MOST' teachers of Bible Prophecy in the past taught that we would 'NOT' be witnessing anything such as what is taking place in 'Real Time' before us. Mario Romano has always remained opened to numerous and different scenarios taking place; Mario personally believes that indeed 'ALL' the Biblical Prophecies will be fulfilled to the very letter 'BUT' a few of them might very well be fulfilled in ways 'NONE' of us expected them to as it concerns the traditionally believed 'Timeline of Endtime Events' !!! Some of the most used Prophecy Experts and servants of GOD such as : Dave Hunt and Chuck Missler, as well as numerous others are very unfortunately no longer with us and this 'Imperfect Vessel' of GOD who doesn't 'look like much' and has never published a 'Bible Prophecy Book' ( and most likely never will*) Mario is just trying his best to 'Correctly Interpret' : Events, Empires and Military Jargon that 'NOT' even the Prophet Daniel understood in his time as he was told to seal the BOOK !!! 'IF' we are indeed witnessing the foundations of what will become 'The Covenant With the Many' then we are "ALL" seriously running out of time; the time to 'play church' is over !!! Mario Romano reminds all of our visitors that the end is 'NOT' yet how much more will the 'Body of Christ' be able to witness is anyone's guess; what we do know is that Israel has now been back in the 'Promised Land' for 70 years and 'ALL' of the Prophesied endtimes enemies of Jerusalem and of the Jewish people are all in sight too and it appears that 'ALL' sides are armed to their teeth and have stockpiled enough weapons of mass destruction to last till Armageddon !!! 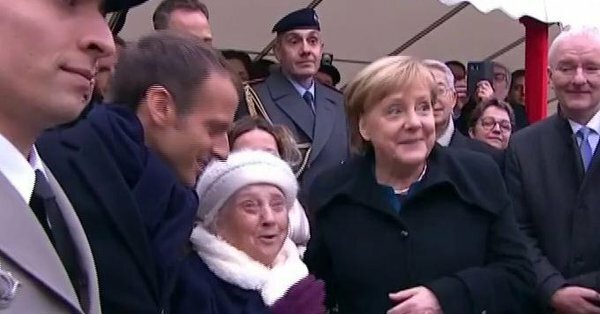 During one of the Armistice Memorial Celebrations in France, a 100 year old Frenchwoman ( Mrs. Paulette Monier*) mistook Angela Merkel for Emmanuel Macron's wife; Ms. Merkel tried to explain to her that she was the Chancellor of Germany and only a good friend of Macron and not his wife. By : an insignificant vessel of GOD ALMIGHTY, this unworthy servant of GOD is extremely shy and that is one of the various reasons why he doesn't publishes his photograph anywhere on this site. Mario Romano acknowledges that it is GOD alone who rewards His true servants who are correctly teaching His Prophetic word. Mario Romano does 'NOT' seek any temporary recognition nor earthly reward that men can give 'BUT' he seeks the eternal rewards of GOD and it is his number one goal to lead many to Jesus Christ and remind them of His very soon 'Second Coming' and to hear 'Well Done Good and Faithful Servant' at the end of it all !!! 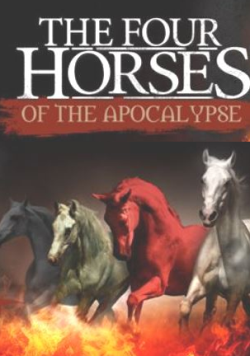 Mario Romano is 'SOMEWHAT' of a semi-expert on Israel's : Past, Present and Future enemies and particularly on its MOST deadly and destructive enemy in all of its history : The 4th and Final Roman Beast of Daniel with 10 Horns !! !